aboard our antique coaches and open cars that feature holiday lights and decorations inside and out. The earlier Niles departure leaves when it's still light enough to enjoy the beautiful scenery of Niles Canyon but dark enough on the return trip to enjoy the train's mesmerizing lights. If you have a wheelchair or need other special assistance, please contact the Station Agent. ADA wheelchair access is only to selected (covered) Open Cars, due to the narrow doors on our antique coaches. Train of Lights is our flagship fundraising event for the year, so tickets are not refundable. However, if you are unable to make your train, you may be able to exchange your tickets for tickets on another train for a $20 fee if there are a sufficient number of tickets available on that train. Contact the Station Agent for more information. Tickets go on sale Saturday, October 13th at 10AM. First Class Dome tickets include a reserved seat in the ATSF 505 Dome Car. Reserve an entire caboose just for your group, and climb up into the cupola for a bird's-eye view of the train with a docent aboard to tell you about the railroad. Contact the Station Agent for more information, rates, and availability of whole-train charters. 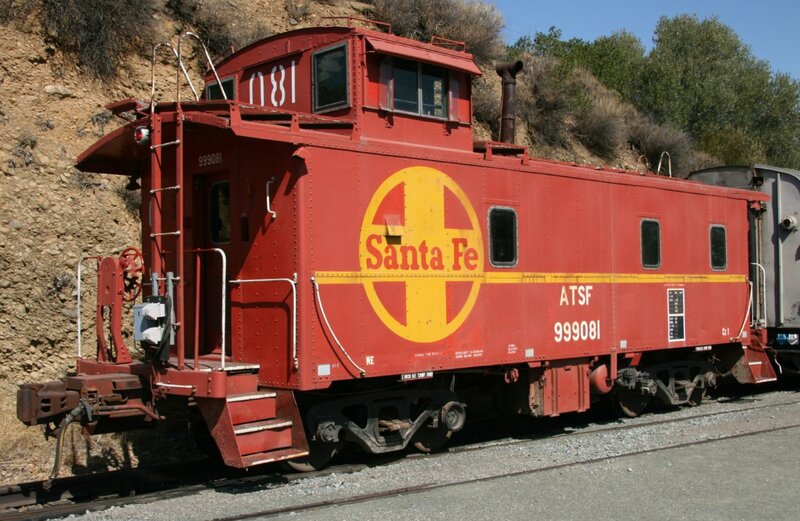 Trains run rain or shine, and the canyon can get very cold and windy at night in the winter. The train includes inside and outside seating, but we don't guarantee an inside seat, so be prepared for cold, wind, and inclement weather and dress accordingly. Allow more time to get to your boarding location and park if there's bad weather. There are only ADA accommodations on designated covered "Open" cars, and wheelchairs may not move about the train due to the narrow aisles and doorways of the antique equipment.